1. Preheat the oven to 200°C, gas mark 6. Heat a large pan over a high heat, add the spinach and cover with a lid. Steam for 2-3 minutes, stirring occasionally until wilted. Drain thoroughly then leave to cool. Lay the spinach between several sheets of kitchen paper and squeeze out as much liquid as possible. Finely chop then put into a large bowl. 2. Heat a little oil in a small frying pan, add the shallots and garlic and fry for 5 minutes until soft. Leave to cool then add to the spinach. Stir in the herbs and cream cheese and season to taste. 3. Lightly flour the work surface then roll out the pastry into a rectangle roughly 28 x 30cm, the thickness of a pound coin. Starting 2cm in from the long edge, spread half of the spinach mixture into a rectangle the same size as the piece of salmon. Lay the salmon on top, then spread the remaining spinach mixture over in an even layer. 4. 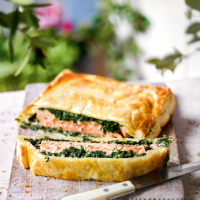 Brush the edges of the pastry with a little beaten egg then fold over to cover the salmon. Press down around the edges, making sure there are no pockets of air. Trim away the excess pastry then crimp the edges with a fingertip or fork to seal. Transfer to a baking tray lined with greaseproof paper then brush with the remaining egg. Bake for 25 minutes until golden brown and piping hot. Remove from the oven, leave to stand for 5 minutes then slice into 4–6 pieces and check the salmon is cooked through. Serve with asparagus or a simple green salad. This recipe was first published in Thu Jul 21 09:44:00 BST 2016.